Lupin the 3rd never gets old and gets more entertaining with each PART! Loving the characters and the thought put into it. The only thing I wish is that they would bring the old goofy-emotional Zenigata back. I'm not too sure how I feel about the serious one. Regardless, 5 out of 5. The show is entertaining as ever! This new series is off to a very strong start, with a very interesting focus on the dark web and high-tech gadgets. No matter what decade they're in, the Lupin gang age like fine wine, retaining their classic sense of 70's coolness while also effortlessly adapting to the current times. Part 5 is no different. Production wise it's as much of a feast for the eyes as ever, thanks to the very talented folk at Telecom Animation Film, and the musical score by series veteran Yuji Ohno is wonderful, as should go without saying at this point. All in all there's not much to dislike so far, it's just a really well-made show and I'm excited to see where things go from here for the characters, new and old. Despite being a series that started back in the early 70's, this show continues to be fun and entertaining. There's a great balance of silly classic cartoon humor, well put together chases, and action scenes that flow into each other without coming across as jarring. Even if you haven't seen any previous seasons, the format of the show is easy to follow. Both this season and Part 4 have their own self contained plots to keep new viewers from getting lost. It also does a great job of avoiding many anime tropes that are starting to feel a bit stale (at least to me). If you are a fan of heist movies, miss "the classics", or even if you just like fun action in general, you should really check this show out. The same goes for Part 4. Title says it all, even though its a part 5 it's relatively easy to watch with no prior viewings of other seasons or movies, only part which is canonically connected i'm fairly sure is part 4. Although at the point i'm up to when writing this review, there are no real story connections. Ami probably learned to programme from the internet. This is how you become a true programmer! Like the title says this feels like a modernized green jacket to me. Same silly fun but with up to date topics with a plot that adjusts to current times. Lupin and cast are the same characters that you know and love, nothing is changed. Production and style are pretty good (love those washy backgrounds), plot is ok and overall is a super fun watch. I just wish more Fujiko action for the second part. Great classic anime with a modern twist! UPDATED Review: Unfortunately, I will have to knock Lupin the 3rd Part 5 down to 4 stars and I would also consider it sometimes a 3 star series as well in a few instances in some episodes. The writing for the show is not what I would call 5 star quality and the relationship between Fujiko and the character Amy is not written well in particular either. However, this series is quite compelling in making one want to watch the next episode one after another though which is to be expected from the Lupin series. 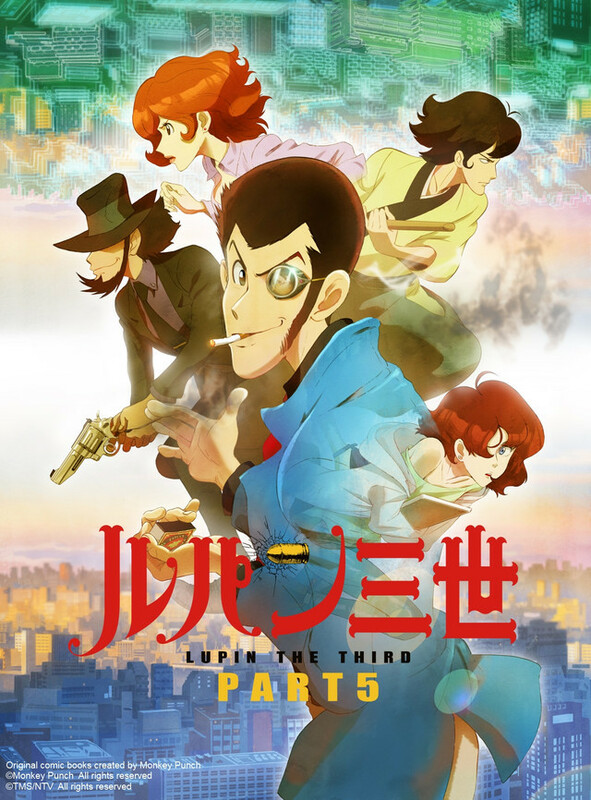 Please enjoy watching Lupin the Third Part 5 if you are a fan of Lupin and fast paced action scenes and adventures in general! LUPIN the 3rd PART 5 is everything you know and love about Lupin and his gang. Even if you do not know the main characters going into the series or are at least a little familiar with the characters from watching a few episodes in the past (per myself), this series is excellent in introducing its main characters and even new characters for viewers to enjoy regardless if they are familiar with this classic series or not. The story circles around a social media internet game that is about catching and/or killing the famous theif, Lupin. With a new female character introduced to Lupin and his friends in episode one, the chase ensues for Lupin as he travels all over the world trying not to get caught or in this case, almost getting caught but escaping every time with the detective Zenigata hot on his trail! I have found once in a blue moon (I am up to episode 5) that there are some predictable moments (like only 2 instances I have seen out of the 4 episodes I have watched so far and that's pretty much it, not even close to terrible in this case), but mostly this entire series is written incredibly well so far and a lot of love was put into it by the studio who produced it I find. It is most certainly a refreshing anime series that gives us a break from your stereotypical anime series that are just made to sell love pillows and such merchandise. Can't promise anything about the character Fujiko though, haha. I highly recommend this anime to any viewer who enjoys a great story and quality anime shows. Even if one is not an anime fan, I would recommend this show to anyone who enjoys entertainment that has a lot of adventure in it with a dash of comedy. Also if one is interested in this Lupin series, there are four past seasons that you can watch on Crunchyroll of Lupin the 3rd as well since the show was from the 1970's and was continued on from there. I will update my review if my views of the show happen to change. Otherwise, enjoy watching this very miraculous and classic series! An excellent introduction to an essential series. TLDR: You don't know what you're missing if you haven't seen this. A standout of the season, one of the best titles to bear the Lupin banner, and a fun and respectful romp through history for fans. Somehow, Part 5 of Lupin the Third functions equally as both an introduction to the Lupin franchise and as an homage to everything that has come before it. Screwball humor, schmaltzy lewdness, great stunts of daring thievery, and timeless characters and music make this a standout of the year. If you have watched Cowboy Bebop (or Occultic Nine or countless other series) or played Persona 5 but not watched Lupin, you are missing out on half the context. Educate yourself today! The series is neatly split up into several arcs set in the current day. Lupin has been smartly updated for the information age, as comfortable robbing a cryptocurrency exchange has he has always been at safecracking. The arcs tend to be more serious with plenty of action, thrills, and drama. Each story is tautly told, lasting just as long as it needs to with little wasted effort. The arcs are given little intermissions in the form of stand-alone episodes that tend to be less serious. These throwback episodes, complete with older pink, red, and green jackets and subtle art style changes, faithfully capture the fun (if not always the exact feel) of the older episodes. My only complaint is that we don't see as much of (my man) Zenigata at his finest, which was one of the saving graces of part 4. As befits a show about a bunch of thieves, the series resists any kind of moralizing other than that old honor among thieves bit. Lupin is still a covetous fool, hopeless womanizer, and outright monkey, but still manages to do more good than ill in the world. Jigen is a bitter, drunk sexist coot with an out-of-date style, but somehow still comes of as incredibly cool. Fujiko is a conniving femme fatale, but the show will make you respect and love her anyway, and half the fun is waiting to see whether she's got Lupin's back or his *jewels* in a given episode. Goemon is the same fish-out-of-water samurai, now doing his best to live a life of bushido while struggling to answer a smart phone. The supporting characters are never too memorable in Lupin, and that seems to be the case here as well (except for perhaps Albert), but they also never seem forced or overstay their welcome (like Totally Spies Rebecca or Escaflowne DV from part IV). As a bonus, the ED is dripping with sultry French goodness befitting the international heist caper. This series has only gotten better. I LOVE the approach here with the series seamlessly transitioning into the modern world. Overall, I think the plot and storytelling of this series have improved drastically from the days of the old Lupin. I'm legitimately sad it's over. I might watch it again because it's just that freakin' good. As usual, Lupin III is awesome! I love, love, love Lupin III--the series, the movies, the concept--everything. I was really happy when this season came out, and I love how the series solidifies some of the relationships between the characters as being family--like with Lupin, Jigen, and Goemon. Plus, Lupin gets into some pretty serious life-or-death ordeals here, and we see that his close friends actually have to help him out--which is a rare treat. Usually, anime characters either don't need help, only need minor help, or they breeze right over the part where they need help. On the contrary, this series makes it pretty clear that they all function as integral parts of a team. I MUCH prefer this over those single-hero types who can stand alone. That being said, the only reason why I gave this a 4 instead of 5 stars is because this particular season seemed to get a little too involved with politics--like actual politics and boarder-line propaganda with all but partisan support. Traditionally, Lupin's adversaries have always been other criminals and/or corrupt politicians and rulers--but often largely fictitious ones / ones from fictitious countries or parties (like they initially did with the country of Padar in this series). The advantage to using fictitious countries and criminals is that you can still make them realistic, still make your point (for example, if they wanted to make a point on governmental corruption) without essentially calling a % of your audience evil should they be from that country or political party you identified. That being said, it probably wouldn't have been that big of a deal (since, of course, all countries and politicians have corruption. That's why politics is considered a "dirty career") except that, at some point, it becomes unavoidably obvious that the series is going out of its way to exclude Japan from the many, many countries they call out for being corrupt. Japan is idealized in reference or not mentioned at all with corruption, while all other countries are thrown in there aggressively (and sometimes awkwardly, depending on which arc). Likely, this is because they were not wanting to offend their primarily-Japanese audience, but it was still in bad taste (and, again, could have been resolved with the use of fictitious countries or political parties). At times, there are a few scenes where it comes off somewhat xenophobic--sometimes feeling like the message is "all other countries except ours are corrupt and flawed." Add that to the chaotic (and somewhat cringy and arbitrary) conclusion of the last arc, and it feels like the series was definitely made with a political agenda in the forefront of their thoughts. I don't want to think of political agendas and moral lecturing when watching Lupin III. I don't want to consider whether or not the characters I grew up loving are for or against my political beliefs (heck, even if they're for them, I don't want to know--he's a womanizing thief who drives up cliff sides and turns cars into hang-gliders for Pete's sake). I just want to watch Lupin humorously, drastically, and narrowly conquer his life-or-death situation in typical Lupin fashion. That being said, I still definitely recommend this series! It's animated beautifully and the bond between the three friends (Lupin, Jigen, and Goemon) is one of the better attributes of this series. Plus, Zenigata is his usual awesome self, and his respect and actual concern for Lupin is developed and balanced well in the series. Plus, you get a few cameos of characters from previous movies or series--which is great!